Spring has arrived full force in Austin. Just when I was thinking how much I was going to miss our winter, Austin's spring festival season kicked into full gear, with a whole host of outdoor offerings for families. First up in March: Kite Day, one of our favorite family festivals (which is technically in winter, but it feels like spring). Then, last weekend, my family experienced HONK!TX for the first time, a festival of community street bands that is every band geek's dream come true (written by a former band geek: I played the cymbals and xylophones in my high school marching band!). To take in as many bands as possible, I took my sons to the HONK!TX parade day last Sunday. 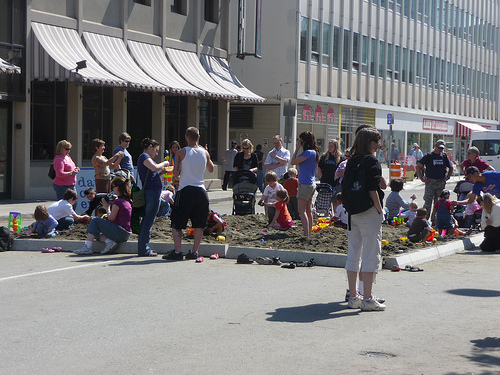 We brought a picnic lunch and sat down on East 2nd street to observe a whole host of marching bands, from the eclectic to the deranged. We had a blast. Here are some pictures from the parade, although I am not posting ones from the thong-wearing band. Last week, Chicago Mayor Emanuel announced a comprehensive strategy to ensure that every child in Chicago lives within a 10-minute walk of a new park or playground. WOW! Here's a news story on the program, called "Chicago Plays," which will build new parks and refurbish 300 city playground over the next five years. By the end of this year alone, the city will open 5 new parks, rebuild 50 playgrounds, and acquire 200 acres of parkland. 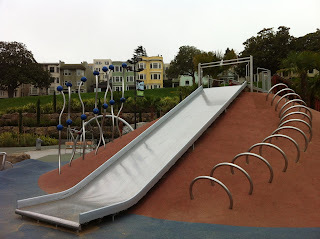 Last year, I blogged about the issue of childrens' access to parks in Austin. Our track record here is dismal: Austin ranks 65th in the country in per capita city spending on parks operations and maintenance, and only 37% of Austin's inner-city residents live within a 10-minute walk of a public park (less than 42% of residents outside the urban core). Meanwhile, in cities such as Chicago, more than 90% of residents can walk to a park (91% in NYC, 97% in Boston, 99% in Minneapolis). A recent City of Austin Urban Parks Workgroup report recommended that the City step up its commitment to expanding park access, by dedicating $20 million in the City's most recent bond election for new park acquisition. Instead, only a fifth of that was put on the ballot last year for voters to approve, which will barely make a dent in closing our city's park access gaps. We have a long way to go. The Chicago model is inspiring. 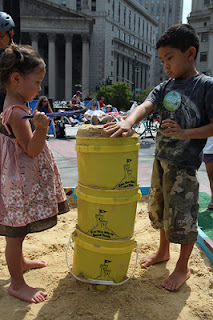 I am have been thinking about sandboxes in cities. Summer is still a few months away, but the weather here in Austin has been gorgeous, and, whenever possible, my family wants to be outdoors. There are very few things that will entertain my two sons -- for hours -- more than sand, dirt, and rocks. 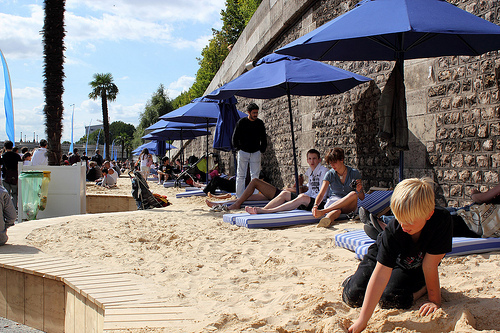 Other cities have decided that, if you live in a city and cannot make it to the beach, bring the beach to you! 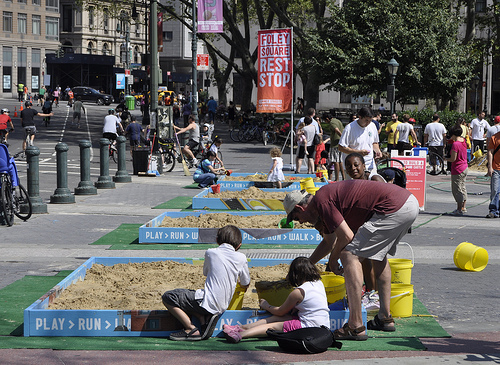 I love the temporary and permanent installations of sand boxes in the cities featured below. 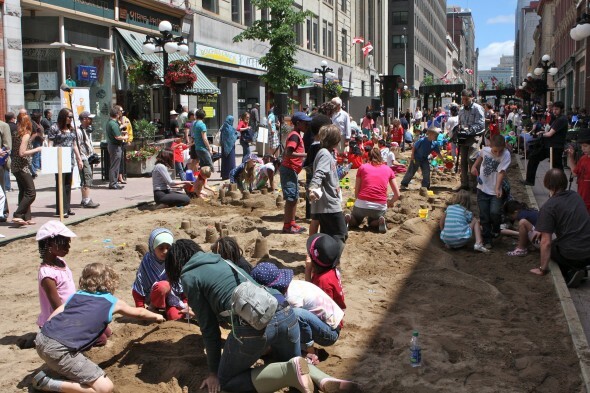 Sandboxes are a fabulous way to draw families into the downtown urban core and a fun way to transform streets that are otherwise dead on the weekends into places of play.